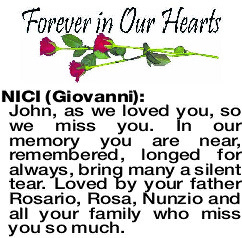 NICI GIOVANNI John, as we loved you, so we miss you. In our memory you are near, remembered, longed for always, bring many a silent tear. Loved by your father Rosario, Rosa, Nunzio and all your family who miss you so much.